It all started when my friend Betsy told me she was making a chocolate icebox cake using Nabisco Famous Chocolate Wafers over the Thanksgiving holiday. After years of eating gluten-free, I realized I hadn’t made (or eaten) this iconic dessert from my childhood in more than a decade. It was time. Time for a little gluten-free nostalgia. I decided to make the cake the way I remembered it – a long log shape that is sliced on the diagonal; when you place each piece on a plate it looks a little zebra-like. The cookies are stacked side-by-side with sweetened whipped cream slathered in between each of them. Then, the whole cookie log is covered with more whipped cream and chocolate shavings. It’s fun, delicious, and kids both young and old, will gobble it up. Although my recipe uses a classic vanilla flavored whipped cream, you can let your imagination go and really doll it up when you’re beating the heavy cream in the mixing bowl: add peppermint extract and then decorate the log with a sprinkle of crushed candy cane, or, add a touch of instant coffee and unsweetened powdered cocoa for a mocha flavored cake, or, make an all-chocolate cake by adding a 1/4 cup unsweetened cocoa powder, 1/3 cup plus 1 tablespoon confectioners’ sugar, and 1 tablespoon pure vanilla extract. The best part is that no matter how you shape the cookies or what you put in the whipped cream, this cake will bring a smile to the faces of everyone you serve it to. So get your holidays off to a good start with a little nostalgia. Make your very own gluten-free icebox cake soon! 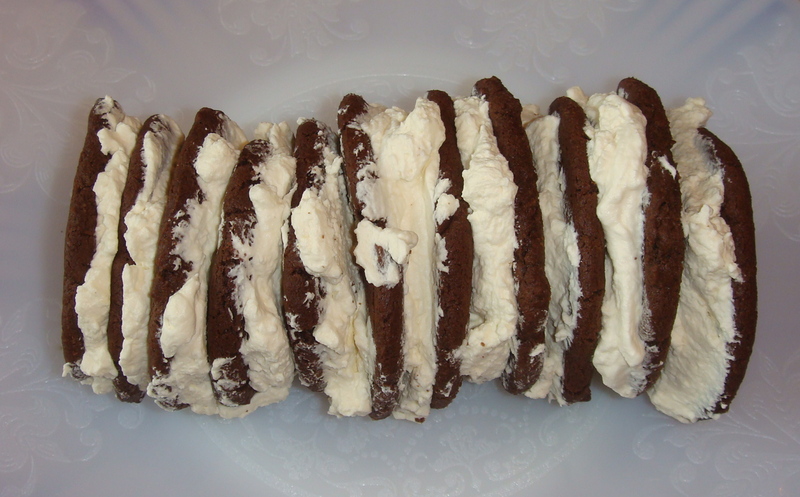 Spread about 1 tablespoon of whipped cream on one side of each cookie and stack them in either a long log shape laid across a long serving plate (for “cupcakes” about 4 cookies stacked vertically). 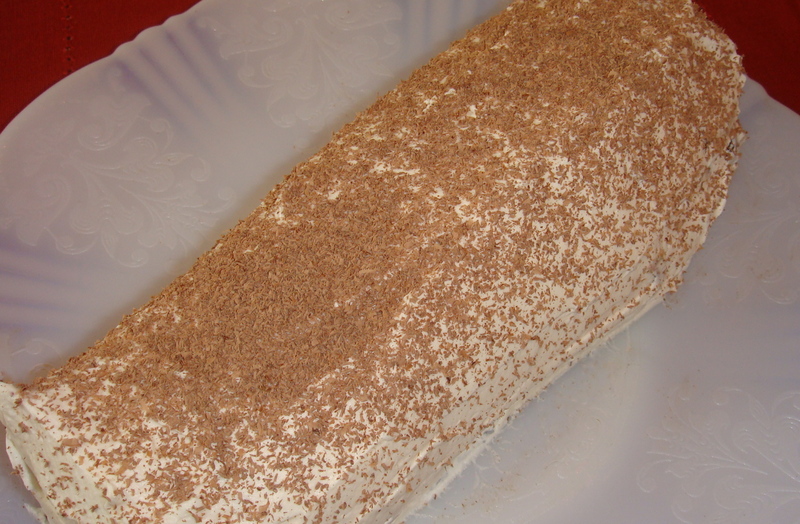 Cover the entire outside of the log with the remaining whipped cream and sprinkle grated chocolate or (shavings) over the top. Refrigerate at least 10 to 12 hours or up to one day. The cookies should become soft as they absorb some of the moisture from the whipped cream topping. 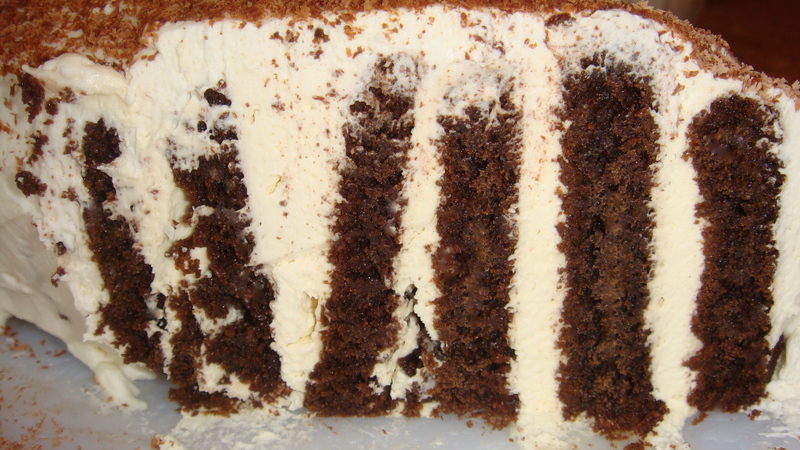 Slice pieces of cake on a diagonal. Serve chilled. Best when eaten within two days of putting the whipped cream on the cookies to make the cake. *Important Cooks Note: You may need to use more whipped cream than he recipe calls for, depending on how generous you are spreading it between the cookies (I’m generous and used more). It is important to have a thick layer on the outside because the cake absorbs a lot of the whipped cream while resting in the refrigerator. 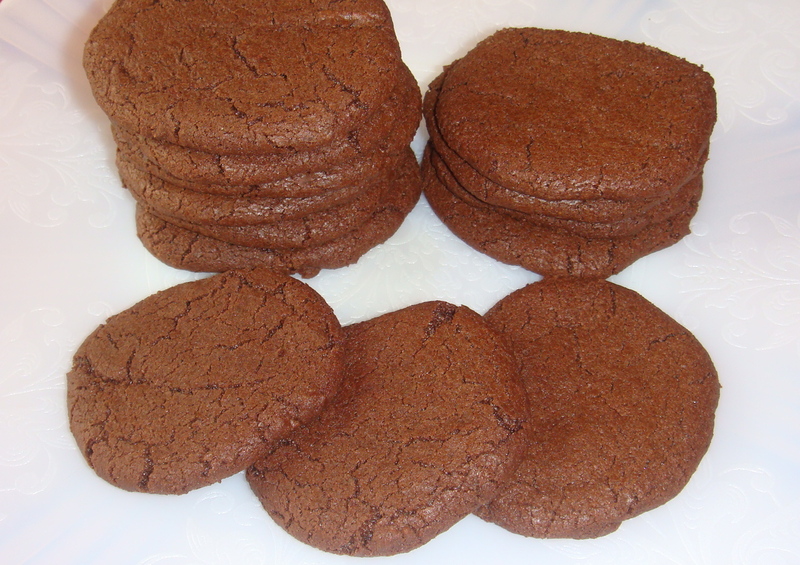 My gluten-free chocolate wafer is crisp and full of chocolate flavor. Try to cut it as thin a possible, about 1/8 inch, which is easiest to do when the dough is very cold. Try not to over bake the cookies, but if you under bake them, they won’t be as crisp. Beat butter, granulated sugar and dark brown sugar at medium speed in large bowl of electric mixer until very well blended. Add egg white, vanilla and chocolate extracts and beat well. Add flour, cocoa powder, xanthan gum, baking soda, and salt; mix until a soft, smooth dough is formed. Drop the dough in small mounds across a large sheet of plastic wrap. Fold the plastic over the dough and shape into a 9-inch long log, leaving plastic open at the ends. Twist ends and flatten dough at each end. Try to smooth log by rolling back and forth on counter. Refrigerate until well chilled. Preheat oven to 350ºF. Position rack in center of oven. Line cookie sheet with parchment paper. Using a thin, sharp knife, slice chilled dough into 1⁄8-inch slices and place 1 inch apart on cookie sheet (be sure the surface of the dough is very smooth before cutting). Bake in center of oven for about 10 minutes, until cooked through (do not over bake). Allow cookies to sit on the cookie sheet for 2- 3 minutes, then transfer to a wire rack and cool completely. 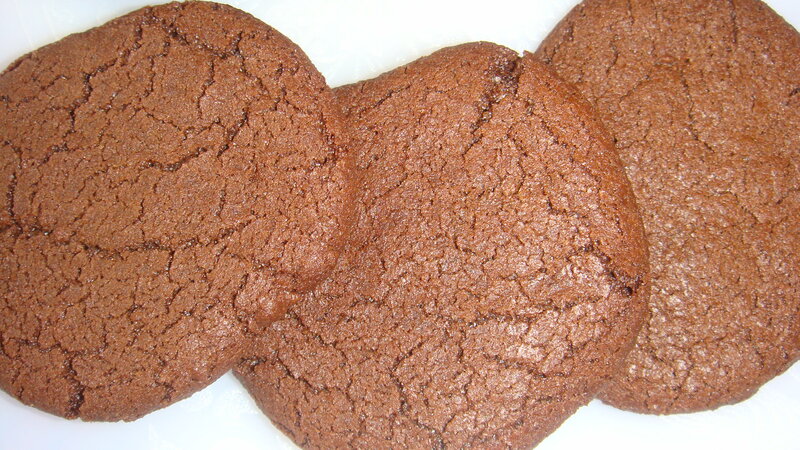 Cookies can be kept in refrigerator for two weeks or frozen for up to one month. Unbaked dough can be stored in refrigerator for up to 3 days or frozen for up to 2 months. To freeze, wrap plastic-wrapped log of dough in foil. **I recommend Nielsen-Massey Pure Chocolate Extract. Combine heavy cream, confectioners’ sugar, and vanilla in large bowl of electric mixer; beat until stiff peaks form. Thanks for the recipe! My Aunt made one of these cakes years ago and I’ve always loved them. I made it for dessert on New Year’s Day and my family went crazy for it. One of my sons (who’s not even GF) said he loved the taste of “cookies & cream” and wants me to make it again for his birthday later this month. Another delicious recipe, Annalise! Thanks so much! You are very welcome! So glad to hear you enjoyed it.